We are very fond of miniature orchids and this species is one we find easy to grow and very rewarding. Ornithophora radicans is a warm growing miniature species from Brazil found near the Atlantic coast at around 400m altitude. However in cultivation our plants are not fussy. We find that the species prefers deep shade and will grow cooler than the habitat suggests and so does well in both Warm and Cool Americas. 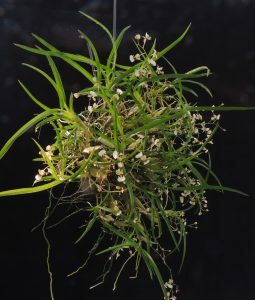 The plant rapidly multiplies into an attractive ball of thin green leaves and little pseudobulbs and is happy mounted, potted or in a basket. We keep plants watered well throughout the year and are rewarded with a profusion of the attractive little flowers that last a long time.